Download and print off this set of very awesome pastel light yellow chalk style cross cupcake toppers to use in decorating your baptism or Easter cupcakes. There are twelve cupcake toppers per sheet – each approximately 2 inches round. 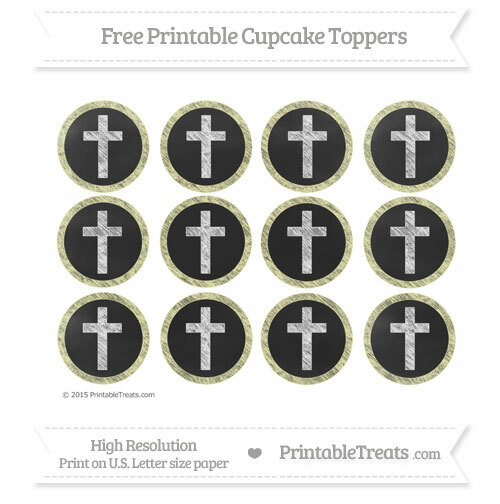 Each cupcake topper has a blackboard background, chalk-style border and a chalk-style cross on the inside. You can use these cute cross cupcake toppers as tags for party favors and goody bags, to decorate party cups, as stickers, or as gift tags. If you would like to share the cupcake toppers with a friend, please send them directly to this page so that they can download a copy for themselves. Please do not link directly to the download file.